Over the last few years we have searched and acquired numerous, and various, Land Rover Series models for future Land Rover restorations by ACH Classic. We always aim to have at least two restorations in build at any one time. No one restoration goes smoothly from start to finish and there are always new surprises that will slow the process so having two or three on the go allows us to jump from one to another to keep the ball rolling. All of our restorations strip the entire vehicle to the barest of bones; once stripped the chassis, if saveable, is blasted, repaired, primed and painted before being treated internally to prevent further rusting. When chassis aren’t repairable that are replaced, normally with a galvanised reproduction, or in some cases with original parts when they have become available. In the case of a new galvanised chassis we will flat and prepare the galvanised surface to remove all of the rough imperfections left by the galvanising treatment, then the surface is coated with a special etch primer before receiving several coats of semi-gloss black. When applying paintwork to a chassis we endeavour to create a far flatter and better finish than original. We can of course, should the customer require it, create a look that resembles the original, but just because that was what happened originally, doesn’t make it right. The axles, gearbox, transfer box and engine are all stripped, repairs made, new bearings gaskets and seals fitted and beautifully painted so that when the customer looks under their beautiful classic Land Rover it will look as good underneath as it will on top. When it comes to the bodywork we try to reuse as many of the original panels as possible. 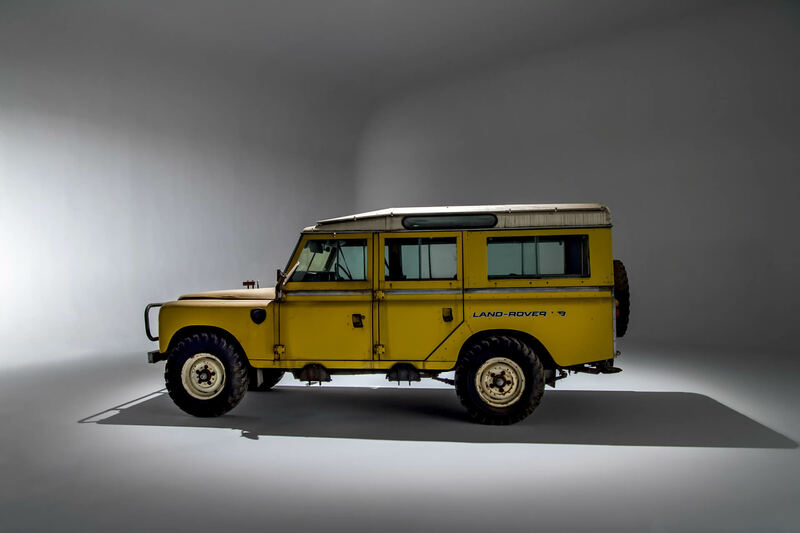 The original Land Rover panels were made from Birmabright which is an alloy of aluminium and magnesium which gives incredibly good rust-resistance, so much so Land Rover didn’t paint under the wheel arches of a Series Land Rover because it wasn’t necessary. However, unfortunately, where aluminium meets steel an electrolysis effect can cause quite severe corrosion. Where this is found we will either replace the panels that are available, or we will remake, by hand, the panels to original specification. The body panels are all then stripped to the bare metal, repaired, etch primed and then painted to the highest quality. Every electrical item, including the wiring loom is replaced with period wiring. The speedometer and gauges are completely overhauled, along with the steering wheel, using original techniques. Unless customers require otherwise a restoration is trimmed to exacting original standards in most cases this is of course black vinyl. The Land Rover Series 3 presented us with some issues when it came to repairing the dashboard. Made up of a metal structure with a formed-foam construction and vacuum-formed vinyl outer layer. The Series 3 dashboard is a complicated structure. We overcame this problem by making a machine to vacuum-form the vinyl over a new CNC machined foam layer. This gives the exacting original look but using modern processes. Acquired in 2017, this fabulous, and very rare, Stage 1 V8 Station Wagon is one of our next restorations. 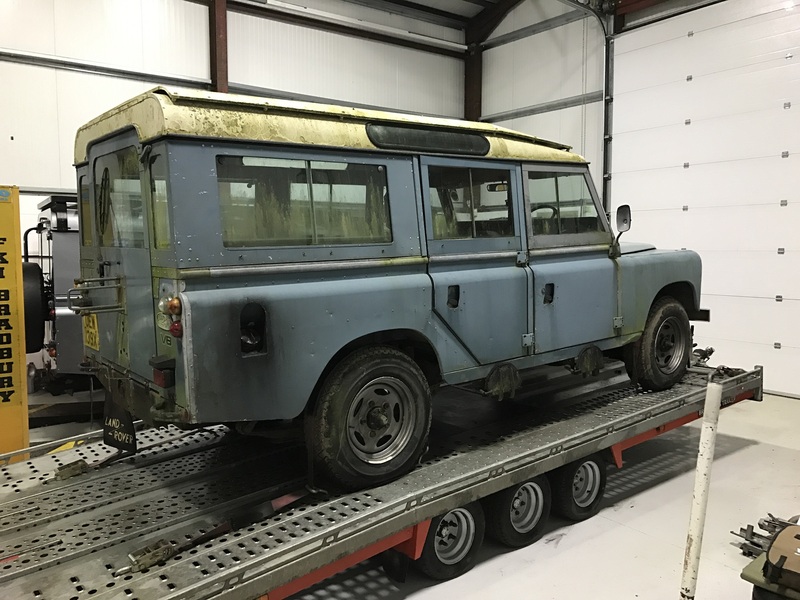 Registered in 1980 and showing 63,000 miles on the clock this Land Rover has suffered in later life. The bulkhead and chassis are rotten beyond repair, yet many of the other panels are in very good condition. Sage 1 V8s are very rare and especially in Inca Yellow, the colour Land Rover used to launch the Stage 1 in Geneva in 1978. This restoration is one we are looking forward to more than any other. We have in stock a brand new old stock genuine chassis that has been in storage for the last 30 years. We have built a bulkhead to the original exacting specification and dimensions, and every rivet and every bolt will be replaced using exacting equivalents to the originals. Many processes that were applied when this car was built in 1980 create some difficulties such as the rear window sections are assembled post-paintwork. We will follow this process keeping the look of the vehicle as close to the original as possible. Every galvanised part will be blasted, dipped and re-galvanised. We then use a process to age the galvanise somewhat to reduce the shine created in the modern process. Bought from a collection last year this fabulous V8 is waiting for a complete rebuild. The chassis is set to be replaced with a genuine Land Rover replacement that we have in stock. As with all of our restorations this Land Rover will have every nut, bolt and rivet replaced. All panels will be repaired and all components overhauled or replaced. It will be finished in its original colour which is Marine Blue. The interior will be retrimmed with the original black vinyl making this V8 as it rolled out of the factory though we guarantee the finish will far surpass the original.